Gone are the days when guys got by on a firm handshake and a high tolerance for whiskey. In an age when men are practicing yoga and getting manicures, but are still expected to open jars and change flat tires, it's no wonder they feel like they've lost their bearings. Well, here's the compass that will lead them in the right direction! 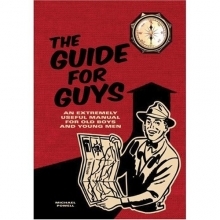 The Guide for Guys walks men through all the things they should--but too often, don't--know. For example, when attacked in the wild, should you play dead, fight back, or run? What is the proper etiquette when hosting a barbecue? Is there a surefire way to impress your boss? From changing directions on the dance floor to wielding a circular saw, from a burly "man's man" to a borderline metrosexual, this amusingly illustrated guide is the go-to book for every guy!